The poll will remain open for a while yet, but enough results are in to call the election - as it were. Rambling's readership is now much more of a common mind than a year ago about which companies are the likely consolidators: Zayo, Level 3, and CenturyLink. Apparently, it's much less crowded at the head of the buyers pack this year. 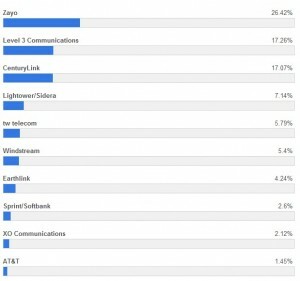 Zayo currently has over 26% of the vote, and given that each person can cast 3 votes that means more than 75% of responders picked them as one of their three. It doesn't get much more definitive than that, and it's a no-brainer of course given Zayo's 7-bagger last year. I've already given my guesses about who they'll go after (FiberLight, Fibertech, FPL Fibernet), but if it's got fiber then it could be a target. Level 3 always shows up high in this series of polls, and given its history of M&A and the end of the heavy lifting of the Global Crossing integration it's also a pretty obvious choice. If they do, I still think it will be Colt or something else in Europe. However, I think that Level 3's consolidation hunger in the US is much weaker than it was in years prior. CenturyLink is also ready for a big move, if not immediately then later this year. The rumors surrounding a bid for tw telecom are clear evidence of the market's anticipation of their intentions, but I still like either Sprint's wireline division or perhaps Windstream (it's growing on me) instead. Regardless, they've built the company to this size and strength by M&A and I agree with readers that they're probably due. Fourth position is currently held by Lightower/Sidera, which assumes of course that their own recently announced merger succeeds. The next three were all much higher on the list last year: tw telecom, Earthlink, and Windstream - reflecting a substantial change in sentiment over the prior year. Meanwhile, AT&T and Verizon's perception as wireline consolidators slipped even further back, reflecting their endless focus on wireless spectrum.